Baltes, P. B. and Baltes, M. M. (1990) Psychological perspectives on successful aging: The model of selective optimization with compensation. In P. B. Baltes and M. M. Baltes (Eds. ), Successful aging. Perspectives from behavioral sciences.(pp. 1-34). New York: Cambridge University Press. Barak, B. and Stern, B. (1986) Subjective age correlates: A research note. The Gerontologist, 26 577. Barnes-Farrell, J. L. and Piotrowski, M. J. (1989) Worker’s perceptions of discrepancies between chronological age and personal age: You’re only as old as you feel. Journal of Psychology and Aging, 4 376-377. Baum, S.K., Boxley, R.L. (1983) Age identification in the elderly. The Gerontologist, 23 532-537. Bergtson, V. L., Kasschau, P. L. and Ragan, P. K. (1977) The impact of social structure on aging individuals. In. J. E. Birren and K. W. Schaie (Eds). Handbook of the psychology of aging (pp. 359) New York: Van Nostrand Reinhold. Braman, A. C. (2003) You are only as old as you feel: But how do you decide how old you feel? Integratingdevelopmental and action-theoretical perspectives. In L. Pulkkinen and A. Caspi (Eds. ), Paths to successful development: Personality in the life course.(pp. 380-408). Cambridge, UK: Cambridge University Press. Bultena, G. L. and Powers, E. A. (1978) Denial of aging: Age identification and reference group orientations. Journal of Gerontology, 33 748-754. Butler, R. N. (1987) Ageism. In: The Encyclopedia of Aging, (pp. 22 – 23). New York: Springer. ESS (2008a) Sampling for the European Social Survey- Round IV: Principles and requirements. ESS. London. Social Science Data Services, Norway – Data Archive and distributor of ESS data. Filipp, S.-H. and Ferring, D. (1989) Zur Alters – Und Bereichsspezifität subjektiven Alterslebens. Freund, A. M. and Smith, J. (1999) Content and function of the self-definition in old and very old age. Journal of Gerontology: Psychological Sciences, 54B 55-67. Furstenberg, A.-L. (1989) Older people’s age self-concept. Social Casework, 70 268-275. Heckhausen, J. (2002) Social comparisons as prototypical strategies in developmental regulation. Hendricks, J. (1987) Age identification. In Maddox, GL (ed.) The Encyclopedia of Ageing.(p. 15) New York: Springer. Kastenbaum, R., Derbin, V., Sabatini, P. and Artt, S. (1972) ‘The Ages of Me’: toward personal and interpersonal definitions of functional aging. Journal of Aging and Human Development, 3 211. Kaufman, G. and Elder, G. H. (2002) Revisiting age identity. A research note. Journal of Aging Studies, 16 169-176. Linn, M. W. and Hunter, K. (1979) Perception of age in the elderly. Journal of Gerontology 34(1) 52. Neugarten, B. L., Moore, J. W. and Lowe, J. C. (1965) Age norms, age constraints, and adult socialization. American Journal of Sociology, 70 710-717. Peters, G. R. (1971) Self-conception of the aged: age identification, and aging. The Gerontologist (4) 69-73. Sherman, S. R. (1994) Changes in age identity. Self perceptions in middle and late life. Journal of Aging Studies, 8 397-412. Staats, S. (1996) Youthfull and older biases as special cases of a self-age optimization bias. Uotinen, V. (1998) Age identification: A comparison between Finnish and North- American cultures. International Journal of Aging and Human Development, 46 109-124. Uotinen, V., Rantanen, T. and Suutama, T. (2005) Perceived age as a predictor of old age mortality: A 13 year prospective study. Age and Ageing, 34 368-372. Westerhof, G. J., Barrett, A. E. and Steverink, N. (2003b) Foreever young: a comparison of age identities in the United States and Germany. Research on Aging, 25 366-383. ISNAD Hess, Moritz , Dikken, Jeroen . "THE ASSOCIATION BETWEEN AGEISM AND SUBJECTIVE AGE OF OLDER PEOPLE IN EUROPE". 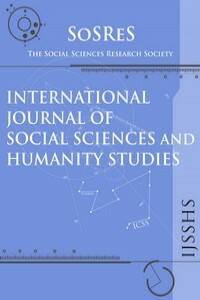 International Journal of Social Sciences and Humanity Studies 2 / 1 (June 2010): 99-109.